Iron Mike!… If that’s not a strain, it should be. Who would have ever thought that Mike Tyson, once looked at as the ‘Baddest Man on the Planet’, and someone who still commands all of the attention when he walks into a room, would have entered into the marijuana industry? On a recent episode of the Joe Rogan Experience Podcast, Mike sat with Joe Rogan, smoking weed and discussing his venture into the weed industry, amongst other things, and talked about the huge benefits the plant bring to people’s lives. 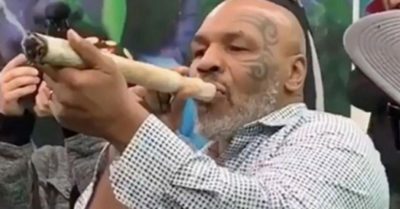 Recently, Tyson attended an event for the rapper’s BREALTV and everyone had their cameras out to capture the former champ light up that foot-long doobie.